In this age of economic globalization, the existence of languages other than your own becomes a daily reality that has to be reckoned with. In different countries, governments tackle the problem by issuing different policies. 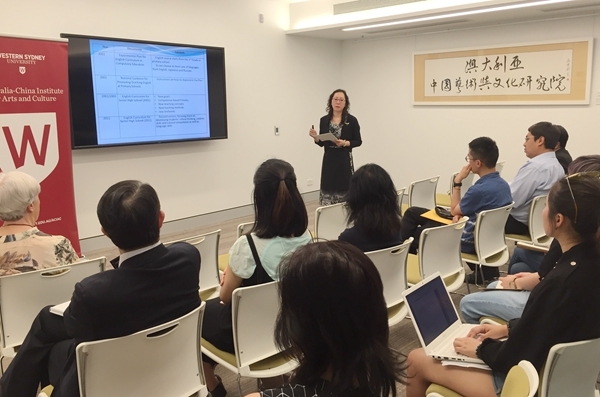 On 7 December, 2017, Endeavour Scholar Professor Wu Haiyan from Inner Mongolian Normal University of China delivered her seminar talk, “Comparing Chinese and Australian Foreign Languages Policies”, at the Australia-China Institute for Arts and Culture. 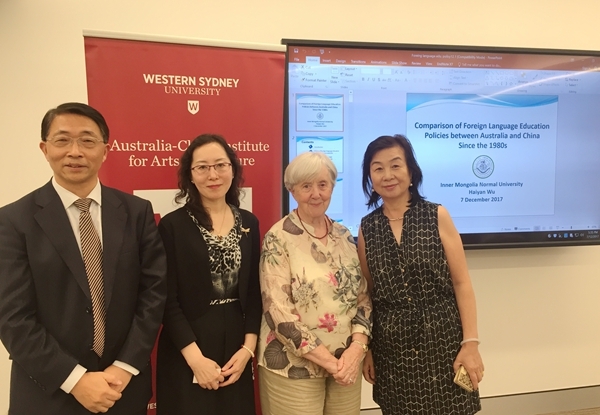 She tracked changes in the Chinese foreign language policy statements since 1949, and the evolution of Australian language policy changes since the beginning of the 20th century, and she analysed the rationales underlying these developments in the two countries. She argued that the widely different language policies of different countries pointed to their different politico-economic and cultural needs. Using Australia as her point of reference, she also believed in the need for the fast diversification of Chinese foreign language education. She cited the example of Mongolian students in her own university, and she called for more choices in terms of the languages that the country provides students, and more choices to be made by individual learners, given their widely varying regional and ethnic backgrounds. Professor Wu’s talk provided food for thought. Australia is officially a monolingual country but it is privileged to have scores of languages in active use in different migrant communities. To Australia, they are more languages, not foreign languages. For some knowledge about that, Professor Wu also visited SBS Radio and Television on December 8.